Letter-Writing Action: Stop Sweden’s Illegal Deportation of Navid Mirpouzadih, Mission Free Iran’s Coordinator of Asylum-Seeker Activities in Sweden! 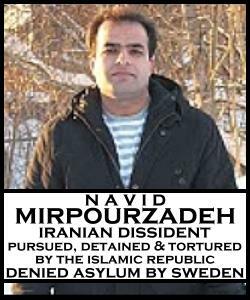 PLEASE SEND THIS SAMPLE LETTER (adjust to your own taste) TO STOP THE ILLEGAL DEPORTATION OF IRANIAN ACTIVIST NAVID MIRPOURZADIH – Mission Free Iran’s Coordinator of Asylum-Related Activities in Sweden. Navid Mirpourzadih is a strong and vocal activist against the Islamic Republic of Iran and its 32 years of crimes against humanity. His brother, a labor-rights activist, was executed by the regime, and he himself was detained and tortured by the same regime. Navid fled for his life to Sweden, seeking asylum, which is his right. Yet the right-wing Swedish government has illegally decided to detain him in preparation for his deportation. There is no question that Navid, who was active against the Islamic Republic in Iran, and has been active against the Islamic Republic outside of Iran, will be detained, tortured again, and executed. We will not allow Navid to suffer the same fate as his brother. It is up to us to do all in our power to stop this crime. TAKE ACTION FOR NAVID! « URGENT: Letter-Writing Action: Stop Sweden’s Illegal Deportation of Peyman Najafi!